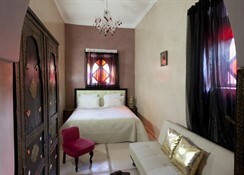 The Riad Le Rubis is located in the heart of the Marrakech Medina. 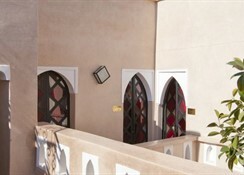 It overlooks the famous Jema El Fna Square.Completely renovated in 2011 and equipped with all modern comforts, Riad Le Rubis combines charm and simplicity, authenticity and serenity, crafts and modernism to mark your visit to the magic of the Orient. 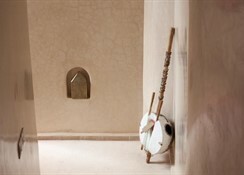 It has six comfortable rooms (air conditioning, bathroom, lounge ...).Riad Le Rubis has a patio, terraces, a pool and steam room. 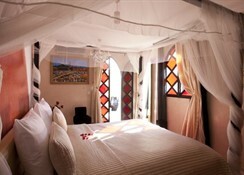 The tree-lined terraces and always sunny, you can admire the panoramic view as the Jemaa El Fna as the Koutoubia. On a clear day, you can see in the background the magnificent view of the peaks of the Atlas.Feel free to quench your thirst with a drink or lunch and dinner in this beautiful setting.Enjoy the magic of this magical place.Our target is to provide our guests with unique moments: attention and kindness that characterize the service of Riad Le Rubis.